Today, NIDA is releasing several new funding opportunity announcements related to the NIH HEAL (Helping to End Addiction Long-term) Initiative℠. Researchers now can submit proposals for major projects funded through NIH HEAL℠ in the areas of preventing opioid use disorder (OUD), improving OUD care in justice settings, determining the appropriate duration of treatment with medications to treat OUD, and better understanding how to manage mild or moderate OUD. Older adolescents and young adults (ages 16-30) are the group at highest risk for opioid initiation, misuse, OUD, and death from overdose, so targeting this age group for prevention interventions could have a sizeable impact on reducing the toll of opioid misuse and addiction. The research project called Preventing At-Risk Adolescents from Developing Opioid Use Disorder as they Transition into Adulthood will develop and test strategies to prevent initiation of opioid misuse and development of OUD in different healthcare settings (including primary care, emergency departments, urgent care, HIV/STI clinics, and school or college health clinics) as well as workplaces and justice settings. NIDA will fund a suite of integrated studies developing, testing, and validating screening and prevention tools in areas most affected by the opioid crisis or with indicators of an emerging crisis. For more information on funding opportunities related to this project, see the funding opportunity announcements for the Coordinating Center and research studies. Substantial research over the past several years has highlighted the consequences of untreated OUD in justice-involved populations—for instance, the high rates of overdose death among people recently released from prison—as well as showing the benefits of treating opioid-addicted prisoners using medication. It remains unknown what specific strategies are most effective at addressing opioid addiction in this population and reducing adverse outcomes. As part of the HEAL Initiative, NIDA will fund the creation of a network of researchers who can rapidly conduct studies aimed at exploring the effectiveness and adoption of medications, interventions, and technologies in justice settings. The Justice Community Opioid Innovation Network will implement a survey of addiction treatment delivery services in local and state justice systems around the country and will develop new research methods to ensure that treatment interventions have the maximum impact. For more information, please see the funding opportunity announcements for the Coordination and Translation Center, Methodology and Advanced Analytics Resource Center, and the research centers. Through two funding opportunity announcements under the heading of America’s Startups and Small Businesses Build Technologies to Stop the Opioid Crisis, NIDA is also inviting small businesses to submit grant applications to develop new biomedical technologies to aid in addressing opioid addiction. Small biomedical companies are encouraged to apply for either small business innovation research (SBIR) or small business technology transfer (STTR) grant applications. For more information, see the SBIR and STTR funding opportunity announcements. In addition to the above referenced projects, NIDA will be partnering with other NIH institutes and centers on several opioid-related research projects. HEAL funds will also be used to answer some important research questions to address the opioid crisis. For example, NIDA’s Clinical Trials Network (CTN) will be utilized to determine the optimal length of medication treatment for opioid addiction and to identify treatment strategies to manage patients who present to primary or integrated care settings with low-level opioid misuse or OUD. Finally, HEAL funds are being considered to support a longitudinal study to understand the consequences of pre- and postnatal opioid and other substance exposure on the developing brain and behavior. A silver lining of the dark cloud of the opioid crisis is that it has galvanized communities, healthcare systems, and government agencies to take significant steps toward ending opioid misuse and addiction in a compassionate, science-based way. The funds granted by Congress as part of the NIH HEAL℠. Initiative will accelerate scientific solutions to the crisis and generate new knowledge that will prevent future drug crises, as well as inform many other areas of medicine and public health. Information related to these projects is available on the NIH site. I've been fighting this epidemic 21, I can see what's working and what's not. I can also tell you what people are responding as opposed to what they are failing with. Working with people in Long term sobriety you can see the situation from a new set of eyes a different perspective and possibly come up with new or better solutions. Grants are wonderful for well-funded academic or research facilities, but unless new insights are gained that can be implemented in a general way, their reach is limited. How about using the federal funds to subsidize providers willing to treat OUD with buprenorphine? I would be happy to treat the Medicaid patients in my community but the reimbursement is not adequate for the intensity of service required. Im a 70yr. old widow of VN vet. Still raising grandchildren and reduced almost immobile, due to complete reduction of chronic pain mgt. I cannot tolerate NSAIDS, due to gut bleeds. Have gone through all required alternatives including spinal injections (now they wont do anymore for 6 mo. ), tens units, etc., etc. I have raised 2 generations while pain was controlled, WITHOUT BEING IDENTIFIED AS AN ADDICT NOR DID I EVER ABUSE THEIR DOSAGE . I tolerated to about half monthly RX, but am now in failing health ! Still have 2 young teens who need me to house, cook, clean, and give a damn about them.! You are WRONG to do this in mass scale.! AT LEAST, take each case individually. At this stage, I am almost immobile (2months ago I could exercise) and thoughts of suicide are coming to me ! (NEVER had them before ! NOW it is becoming a choice YOU and YOUR cohorts in this GOVERNMENT MEDICINE is going to result in your form of genocide of U.S. CITIZENS ! My kids, family, housing, etc., are all immenently at risk! YOU CARE NOTHING FOR INDIVIDUAL CASES ! Hopefully my death will go viral ! Maybe something will force you to do the right thing for chronic pain patients, who have legal rights to pain control. Guess I go to black market , LIKE YOU WANT US TO ! What happens to all of us, IS ON YOU and YOUR bosses black hearts. If u want to know about addiction at it's absolute worst u need to speak with the actual addict. The Substance Abuse and Mental Health Services Administration (SAMHSA) has a “Find Help” page (https://www.samhsa.gov/find-help) with resources to assist people with addiction in finding treatment in their area. You can also call SAMHSA’s helpline directly: 1-800-662-HELP (4357). Brenda-I know how you are suffering- criminal justice system attacks addicts-they are xo easy to jail in their revolving door systems- They can never break free. Now this stupid marijuana craze will create so many more children enslaved to drugs. Arrogant judge sentenced my son to jail in opioid court because he tried too kill himself with heroin. Judge sent a car and two men to apprehend my son who had finally landed his dream job and was off drugs. Jail was too much for him because he had lost his job when released and slipped downhill in despair of ever getting free of the system. ARROGANT JUDGES and probation officers have almost unlimited power, no oversight. I found my son dead soon after. With opioid overdose deaths continuing to soar, it is imperative to find solutions to the epidemic. The magnitude of the crisis will require multiple avenues to get to a final resolution. The components that must be addressed are preventing new onsets of opioid addiction by addressing chronic pain, providing treatment and recovery options to current addicts, and preventing future opioid overdose deaths with effective overdose reversal drugs. What expenses are being put aside to research chronic pain treatment to avoid opioid addiction in the first place? Developing new medications and ways to manage chronic pain is a major priority for NIH. 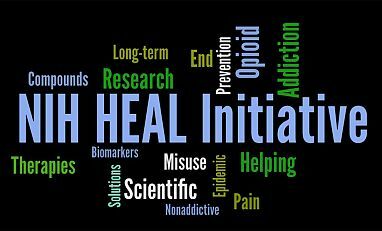 Last year, Congress allotted significant funds for intensive research to find new, more effective and safer pain treatments through the NIH HEAL initiative. You can read more about the NIH HEAL pain research agenda. NIDA. "New Funding Opportunities in Response to the Opioid Crisis." National Institute on Drug Abuse, 10 Dec. 2018, https://www.drugabuse.gov/about-nida/noras-blog/2018/12/new-funding-opportunities-in-response-to-opioid-crisis. NIDA. New Funding Opportunities in Response to the Opioid Crisis. National Institute on Drug Abuse website. https://www.drugabuse.gov/about-nida/noras-blog/2018/12/new-funding-opportunities-in-response-to-opioid-crisis. December 10, 2018.